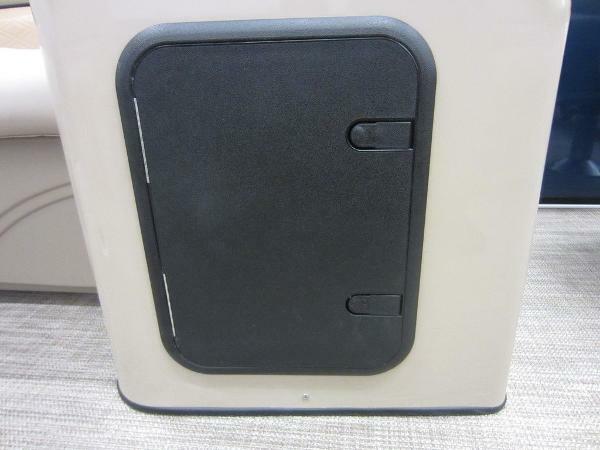 2019 Bentley Pontoon 243 NAVIGATOR SE TRITOON NEW 2019 BENTLEY 243 NAVIGATOR SE TRITOON! Only $35,825 with a 150 hp Mercury 4-stroke EFI outboard. Why buy used when you can buy NEW at this AMAZINGLY low price! 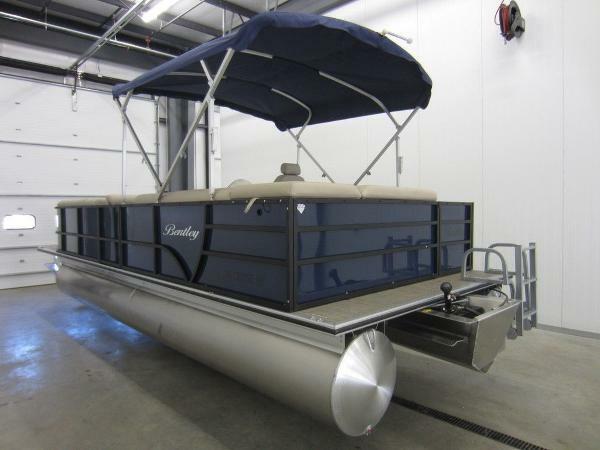 This pontoon is base-priced with a new Mercury 150 hp 4-stroke EFI outboard, however engine options are available up to 250 hp. Factory warranties include; 5-year bow-to-stern warranty, limited lifetime warranty on decking and pontoons, and a 3-year factory warranty on the engine. 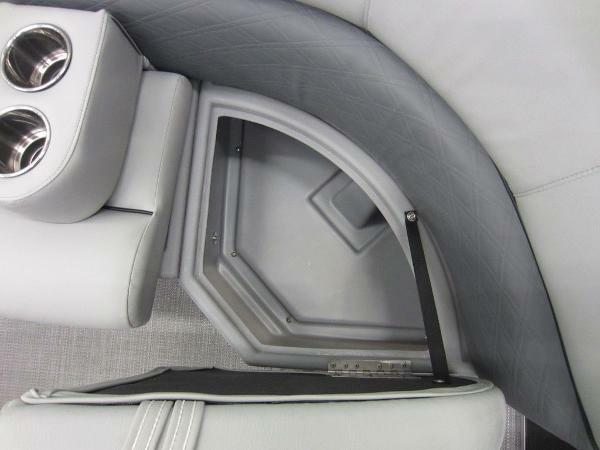 Optional equipment includes: SE gray furniture package, deluxe high-back driver and passenger swivel bucket seats w/sliders and armrests, custom snap-on mooring cover, and deluxe ski/tow bar. Features include: tritoon package including; (3) 25” diameter pontoons, lifting strakes, aluminum underskin, and hydraulic tilt steering, bimini top w/storage boot, Seagrass marine vinyl flooring, custom fiberglass console w/footwell and windscreen, Jensen AM/FM Bluetooth stereo, (4) marine speakers, gauges including: speedometer, tachometer, voltmeter, and fuel; tilt steering, electric horn, navigation/anchor lights, recessed docking lights, courtesy lights, 12-volt power outlet, emergency safety lanyard, removable table w/beverage holders, bow port and starboard layback couches w/under storage, stern port and starboard layback couches w/under storage, Rotocast composite seat bases, stainless beverage holders, (3) moveable beverage holders, bow and port entry/exit doors, center rear exit w/(2) fold-down 4-step boarding ladders, (4) stainless mooring cleats, 32-gallon transom fuel tank, fire extinguisher, marine cranking battery, 8'6" beam, thru-bolted marine decking, nylon rail spacers, M-bracket skirting, all-aluminum transom, 25" diameter pontoons, and 16-person carrying capacity. Trades will be considered and delivery is available. Competitive financing rates and terms are also available. Approximate payment is $329/mo. for 144 mo. with 20% down (WAC). Leaders RPM is one of the largest marine and powersports dealers in the Midwest with over 70,000 sq ft of showroom, parts, and service under one roof located in Kalamazoo, MI. Price is plus freight, prep, sales tax/fees and is subject to change without notice. 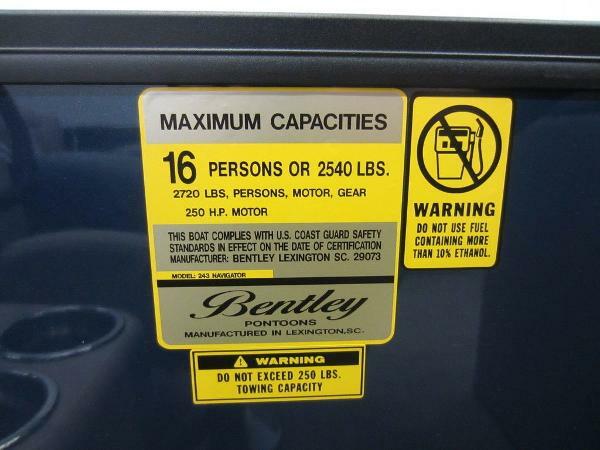 2019 Bentley Pontoon 243 NAVIGATOR SE TRITOON NEW 2019 BENTLEY 243 NAVIGATOR SE TRITOON! Only $35,825 with a 150 hp Mercury 4-stroke EFI outboard. Why buy used when you can buy NEW at this AMAZINGLY low price! 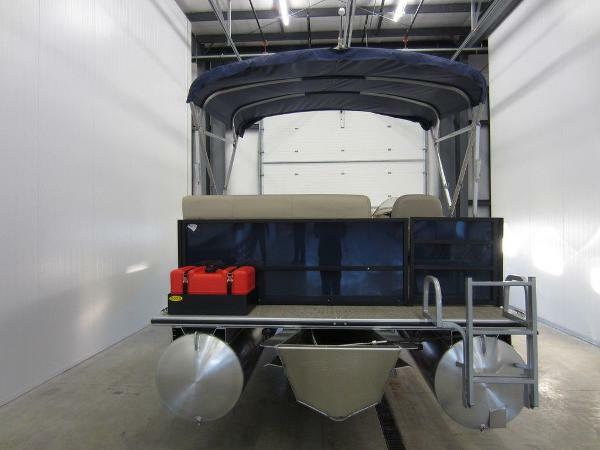 This pontoon is base-priced with a new Mercury 150 hp 4-stroke EFI outboard, however engine options are available up to 250 hp. Factory warranties include; 5-year bow-to-stern warranty, limited lifetime warranty on decking and pontoons, and a 3-year factory warranty on the engine. Optional equipment includes: SE tan furniture package, deluxe high-back driver and passenger swivel bucket seats w/sliders and armrests, custom snap-on mooring cover, and deluxe ski/tow bar. Features include: tritoon package including; (3) 25” diameter pontoons, lifting strakes, aluminum underskin, and hydraulic tilt steering; bimini top w/storage boot, Seagrass marine vinyl flooring, custom fiberglass console w/footwell and windscreen, Jensen AM/FM Bluetooth stereo, (4) marine speakers, gauges including: speedometer, tachometer, voltmeter, and fuel; tilt steering, electric horn, navigation/anchor lights, recessed docking lights, courtesy lights, 12-volt power outlet, emergency safety lanyard, removable table w/beverage holders, bow port and starboard layback couches w/under storage, stern port and starboard layback couches w/under storage, Rotocast composite seat bases, stainless beverage holders, (3) moveable beverage holders, bow and port entry/exit doors, center rear exit w/(2) fold-down 4-step boarding ladders, (4) stainless mooring cleats, 32-gallon transom fuel tank, fire extinguisher, marine cranking battery, 8'6" beam, thru-bolted marine decking, nylon rail spacers, M-bracket skirting, all-aluminum transom, 25" diameter pontoons, and 16-person carrying capacity. Trades will be considered and delivery is available. Competitive financing rates and terms are also available. Approximate payment is $329/mo. for 144 mo. with 20% down (WAC). Leaders RPM is one of the largest marine and powersports dealers in the Midwest with over 70,000 sq ft of showroom, parts, and service under one roof located in Kalamazoo, MI. Price is plus freight, prep, sales tax/fees and is subject to change without notice. 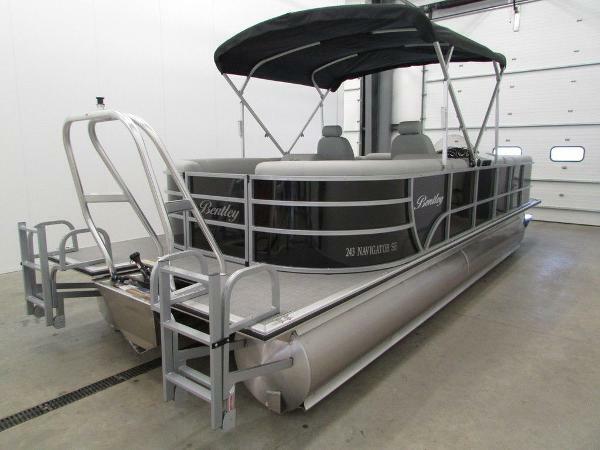 SOLD 2014 Bentley Pontoon 220 CRUISE RE SE CLEAN 2014 ENCORE BENTLEY 220 CRUISE RE SE! 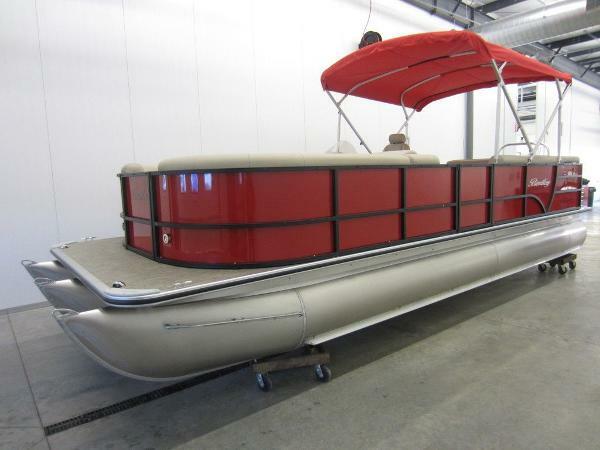 A 50 Mercury 4-stroke EFI outboard powers this nicely equipped pontoon. 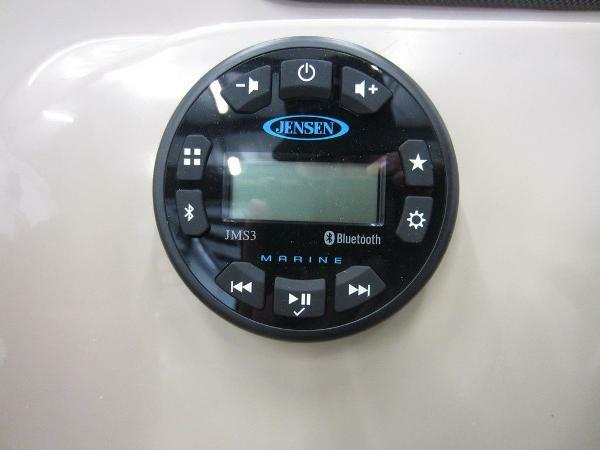 Features include: snap-on mooring cover, color coordinated bimini top, fiberglass console w/molded dash, Jensen AM/FM stereo w/Bluetooth and AUX, (4) marine speakers, Faria gauges including; fuel, voltmeter, speedometer, and tachometer; lighted helm switches, electric horn, navigation and docking lights, 12-volt power outlet, beverage holders, removable table (not pictured), Rotocast composite seat bases, port and starboard bow layback couches w/storage, stern L-shaped bench seating w/storage, drivers high back swivel seat w/slider and armrests, stern padded and pillowed sundeck, changing room w/privacy curtain, 3-step boarding ladder, (4) mooring cleats, 8’6” beam, 25” diameter pontoons, aluminum transom, nylon fence rail spacers, thru-bolted marine decking, powder coated railings, (3) entry/exit doors (oversized front entry door), fire extinguisher, marine cranking battery, 24-gallon fuel capacity, and 16 passenger capacity. 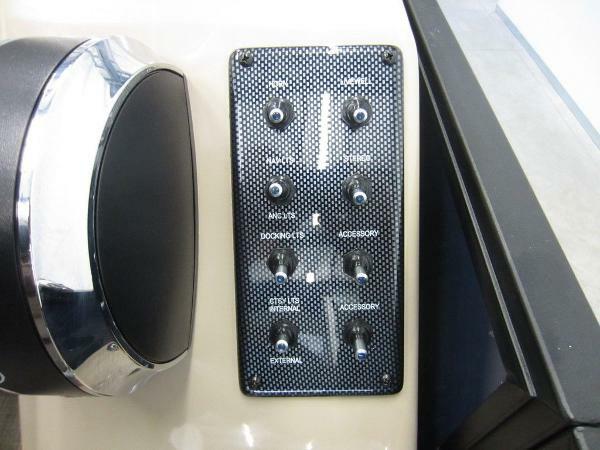 This boat is in excellent overall condition with minimal wear and only 226 engine hours (see pics/video). 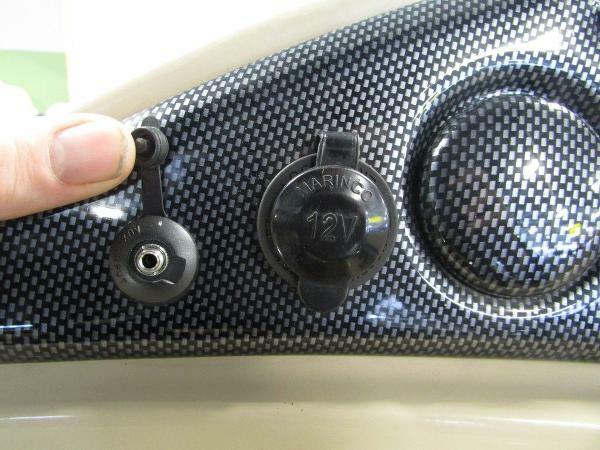 It has been inspected by our factory-trained technicians and is mechanically sound. 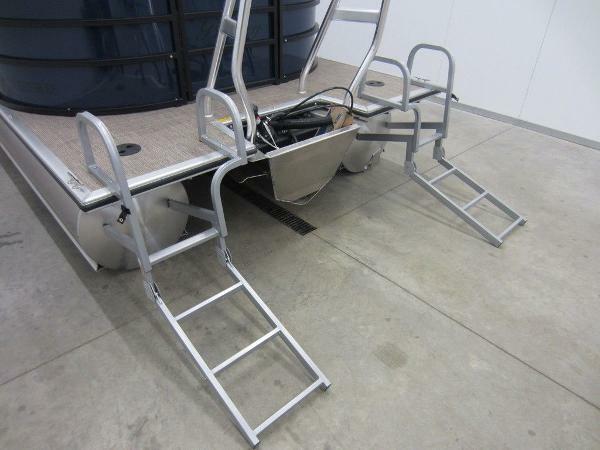 The trailer pictured is not included, however, float-on bunk or scissor trailers are available for purchase. 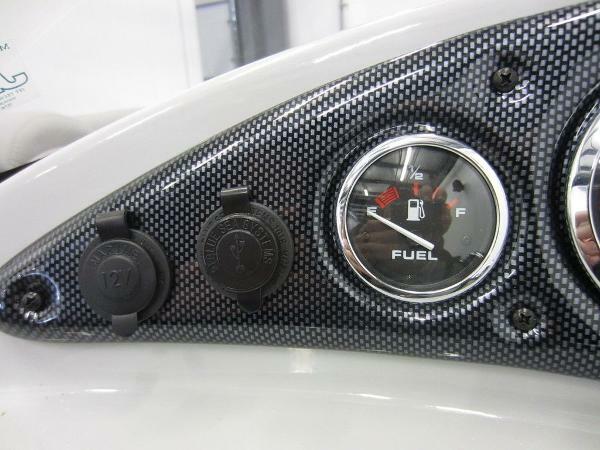 Trades will be considered and competitive financing rates and terms are available. Approximate payment of $197/mo. w/20% down for 120 mo. (WAC). Leaders RPM is one of the largest marine and powersports dealers in the Midwest with over 70,000 sq ft of showroom, parts, and service under one roof located in Kalamazoo, MI. Price is plus sales tax/fees and is subject to change without notice. 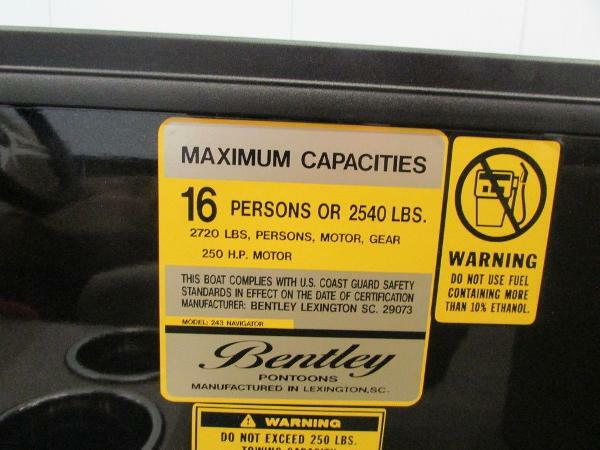 2019 Bentley Pontoon 243 NAVIGATOR SE TRITOON NEW 2019 BENTLEY 243 NAVIGATOR SE TRITOON! 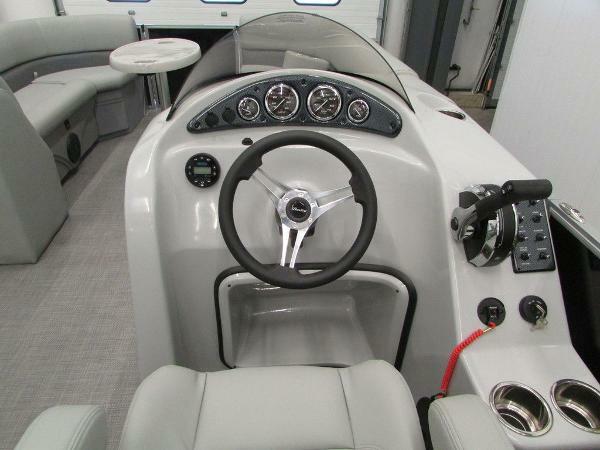 Only $35,825 with a 150 hp Mercury 4-stroke EFI outboard. Why buy used when you can buy NEW at this AMAZINGLY low price! 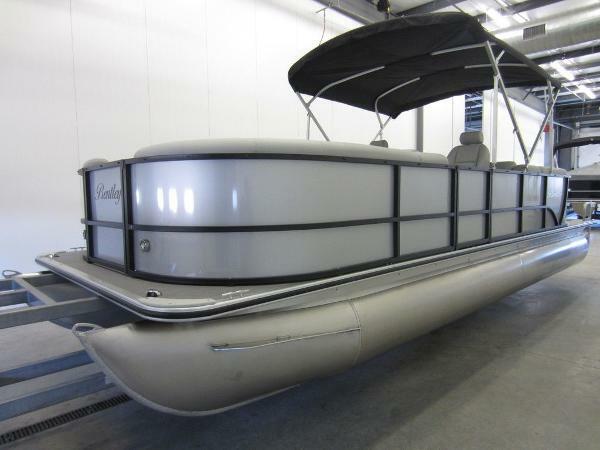 This pontoon is base-priced with a new Mercury 150 hp 4-stroke EFI outboard, however engine options are available up to 250 hp. Factory warranties include; 5-year bow-to-stern warranty, limited lifetime warranty on decking and pontoons, and a 3-year factory warranty on the engine. 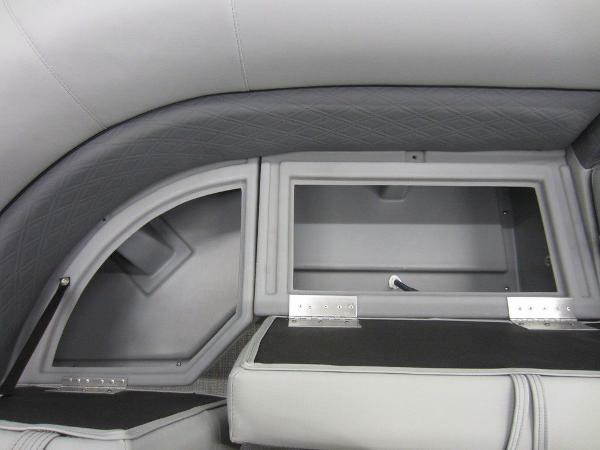 Optional equipment includes: SE tan furniture package, deluxe high-back driver and passenger swivel bucket seats w/sliders and armrests, custom snap-on mooring cover, and deluxe ski/tow bar. Features include: tritoon package including; (3) 25” diameter pontoons, lifting strakes, aluminum underskin, and hydraulic tilt steering, bimini top w/storage boot, Seagrass marine vinyl flooring, custom fiberglass console w/footwell and windscreen, Jensen AM/FM Bluetooth stereo, (4) marine speakers, gauges including: speedometer, tachometer, voltmeter, and fuel; tilt steering, electric horn, navigation/anchor lights, recessed docking lights, courtesy lights, 12-volt power outlet, emergency safety lanyard, removable table w/beverage holders, bow port and starboard layback couches w/under storage, stern port and starboard layback couches w/under storage, Rotocast composite seat bases, stainless beverage holders, (3) moveable beverage holders, bow and port entry/exit doors, center rear exit w/(2) fold-down 4-step boarding ladders, (4) stainless mooring cleats, 32-gallon transom fuel tank, fire extinguisher, marine cranking battery, 8'6" beam, thru-bolted marine decking, nylon rail spacers, M-bracket skirting, all-aluminum transom, 25" diameter pontoons, and 16-person carrying capacity. Trades will be considered and delivery is available. Competitive financing rates and terms are also available. Approximate payment is $329/mo. for 144 mo. with 20% down (WAC). Leaders RPM is one of the largest marine and powersports dealers in the Midwest with over 70,000 sq ft of showroom, parts, and service under one roof located in Kalamazoo, MI. Price is plus freight, prep, sales tax/fees and is subject to change without notice. 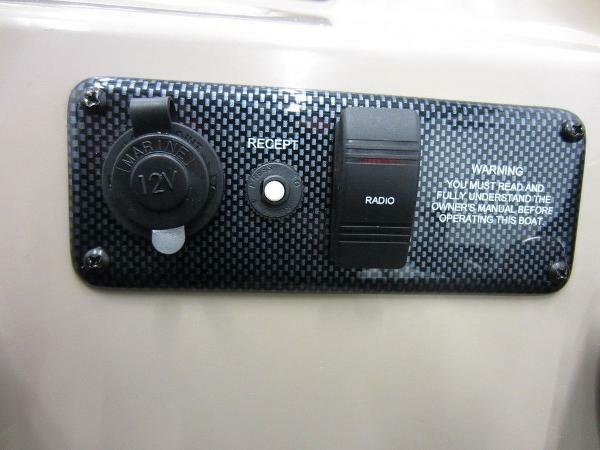 2019 Bentley Pontoon 223 NAVIGATOR SE TRITOON NEW 2019 BENTLEY 223 NAVIGATOR SE TRITOON! Only $34,216 with a 150 hp Mercury 4-stroke EFI outboard. Why buy used when you can buy NEW at this AMAZINGLY low price! This pontoon is base-priced with a new Mercury 115 hp 4-stroke EFI outboard, however engine options are available from 10 to 175 hp. Factory warranties include; 5-year bow-to-stern warranty, limited lifetime warranty on decking and pontoons, and a 3-year factory warranty on the engine. 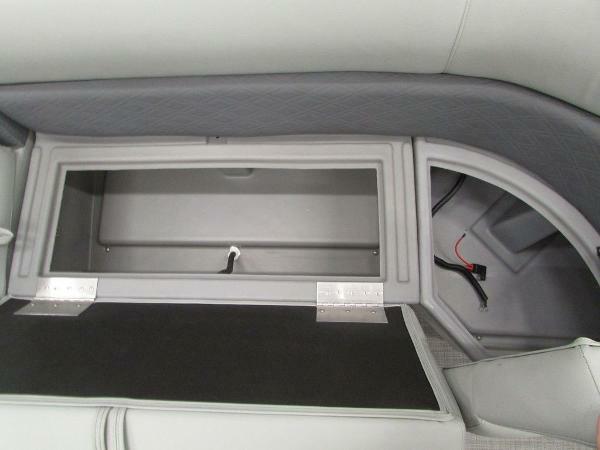 Optional equipment includes: SE appearance package, deluxe high-back driver and passenger bucket seats, custom snap-on mooring cover, tilt steering, and deluxe ski tow bar. 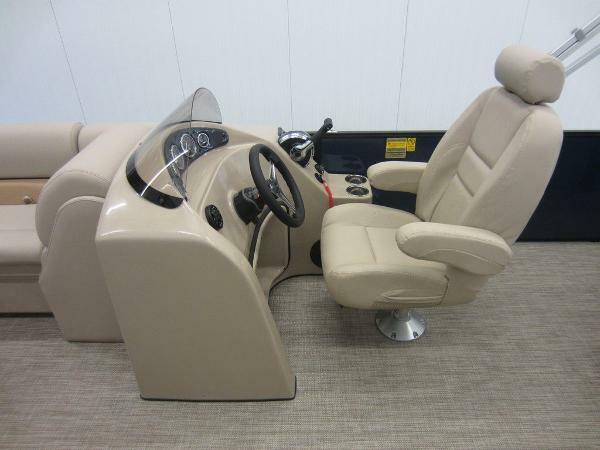 Features include: tritoon package including; (3) 25” diameter pontoons, lifting strakes, aluminum underskin, and hydraulic tilt steering, bimini top w/storage boot, Seagrass marine flooring, custom fiberglass console w/footwell and windscreen, Jensen AM/FM Bluetooth stereo w/AUX-USB ports, (4) marine speakers, gauges including: speedometer, tachometer, voltmeter, and fuel; electric horn, navigation/anchor lights, recessed docking lights, courtesy lights, 12-volt power outlet, emergency safety lanyard, removable table w/beverage holders, bow port and starboard layback couches w/under storage, driver and passenger reclining swivel captains seats w/sliders and arm rests, stern port and starboard layback couches w/under storage, Rotocast composite seat bases, stainless beverage holders, (3) moveable beverage holders, bow and port entry/exit doors, center rear exit w/(2) fold-down 4-step boarding ladders, (4) stainless mooring cleats, 32-gallon transom fuel tank, fire extinguisher, marine cranking battery, 8'6" beam, thru-bolted marine decking, nylon rail spacers, M-bracket skirting, all-aluminum transom, 25" diameter pontoons, and 15-person carrying capacity. The trailer pictured is NOT included, however, float-on and scissor trailers are available for purchase. Trades will be considered and delivery is available. Competitive financing rates and terms are also available. Approximate payment is $291/mo. for 144 mo. with 20% down (WAC). Leaders RPM is one of the largest marine and powersports dealers in the Midwest with over 70,000 sq ft of showroom, parts, and service under one roof located in Kalamazoo, MI. Price is plus freight, prep, sales tax/fees and is subject to change without notice. 2019 Bentley Pontoon 200 Cruise SE RE NEW 2019 BENTLEY 200 CRUISE SE RE! Only $21,683 with a Mercury 40 hp 4-stroke EFI! Why buy used when you can buy NEW at this AMAZINGLY low price! This pontoon is base-priced with a new Mercury 25 hp 4-stroke EFI outboard; however, engine options are available from 10 to 115 hp. Factory warranties include; 5-year bow to stern warranty, limited lifetime warranty on decking and pontoons, and a 3-year factory engine warranty. 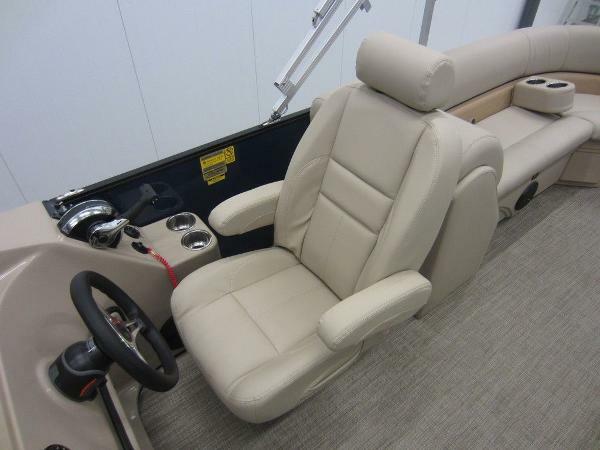 Optional equipment includes: SE trim package, deluxe high back captain’s chair, seagrass marine flooring, tilt steering, and custom snap-on mooring cover. 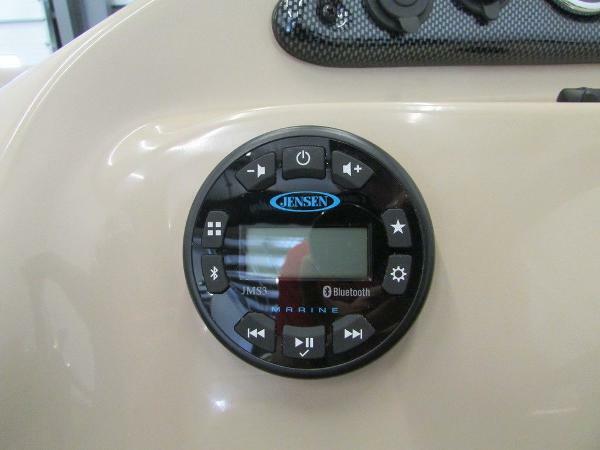 Features include: bimini top w/storage boot, fiberglass console w/foot-well, Jensen AM/FM Bluetooth stereo, (4) marine speakers, gauges including: tachometer, voltmeter, and fuel; electric horn, anchor/navigation lights, recessed docking lights, courtesy lights, 12-volt power outlet, USB outlets, emergency safety lanyard, removable table w/beverage holders, driver reclining swivel bucket seat w/slider and flip-up armrests, port and starboard bow couches w/under storage (starboard couch is a layback), stern L-shaped couch w/under storage and cooler, Rotocast composite seat bases, aft padded sundeck, (3) movable beverage holders, (2) entry/exit doors (port/bow), rear exit w/fold-down 4-step boarding ladder, (4) stainless mooring cleats, 32-gallon transom fuel tank, fire extinguisher, marine cranking battery, 8'6" beam, thru-bolted marine decking, nylon fence rail spacers, M-bracket skirting, all-aluminum transom, 25" diameter pontoons, and 14-person carrying capacity. 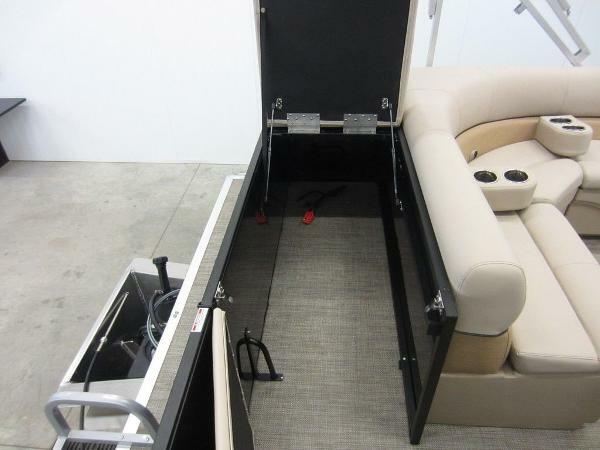 The trailer pictured is not included, however, float-on or scissor trailers are available for purchase. Trades will be considered and delivery is available. Competitive financing rates and terms are also available. Approximate payment is $211/mo. for 120 mo. with 20% down (WAC). Leaders RPM is one of the largest marine and powersports dealers in the Midwest with over 70,000 sq ft of showroom, parts, and service under one roof located in Kalamazoo, MI. Price is plus freight, prep, sales tax/fees and is subject to change without notice. 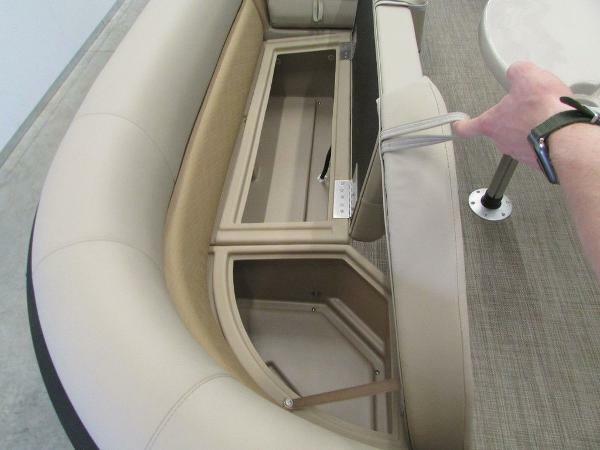 2019 Bentley Pontoon 180 Cruise SE RE SAVE THOUSANDS ON THIS NEW 2019 BENTLEY 180 CRUISE SE RE! Only $18,956 with a 40 hp Mercury 4-stroke! Why buy used when you can buy NEW at this AMAZINGLY low price! 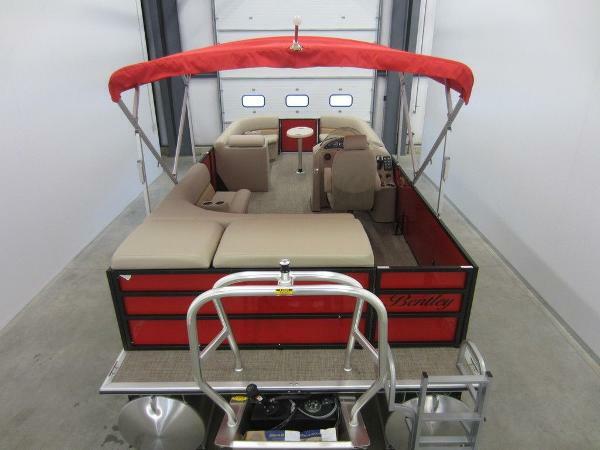 This pontoon is base-priced with a new Mercury 25 hp 4-stroke EFI outboard; however, engine options are available from 10 to 60 hp. Factory warranties include; 5-year bow to stern warranty, limited lifetime warranty on decking and pontoons, and a 3-year factory warranty on the engine. Options include: snap-on mooring cover, SE gray furniture package, tilt steering, and captain’s swivel bucket seat w/slider and armrests. 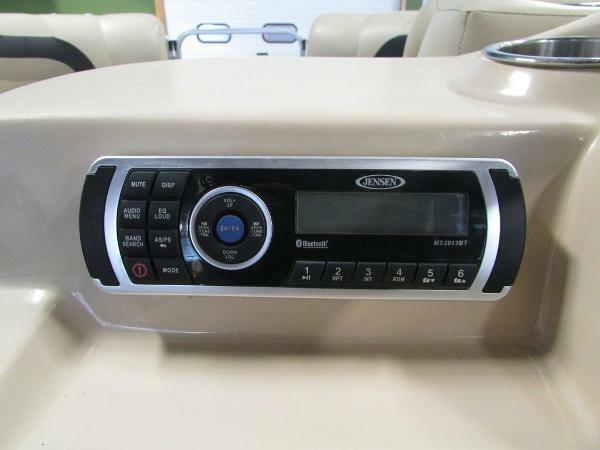 Features include: bimini top w/storage boot, fiberglass console w/windscreen and storage, Jensen AM/FM stereo w/marine speakers, tachometer and voltmeter, electric horn, navigation/anchor lights, recessed docking lights, courtesy lights, 12-volt power outlet, removable table w/beverage holders, starboard bow couch w/under storage, port bow corner seat w/under storage, stern L-shaped couch w/under storage, on-board cooler w/drain, Rotocast composite seat bases, (3) movable beverage holders, bow and port entry/exit doors, rear exit w/fold-down 4-step boarding ladder, Seagrass marine flooring, (4) stainless mooring cleats, 12-gallon fuel capacity, fire extinguisher, marine cranking battery, 8'6" beam, thru-bolted marine decking, powder-coated railings, nylon fence rail spacers, M-bracket skirting, all-aluminum transom, 25" diameter pontoons, and 8 person carrying capacity. The trailer pictured is NOT included, however, float-on or scissor trailers are available for purchase. Trades will be considered and delivery is available. Competitive financing rates and terms are also available. Approximate payment is $184/mo. for 120 mo. with 20% down (WAC). Leaders RPM is one of the largest marine and powersports dealers in the Midwest with over 70,000 sq ft of showroom, parts, and service under one roof located in Kalamazoo, MI. Price is plus freight, prep, sales tax/fees and is subject to change without notice. 2019 Bentley Pontoon 240 Navigator SE NEW 2019 BENTLEY 240 NAVIGATOR SE! Only $25,440 with a 50 hp Mercury 4-stroke EFI outboard. Why buy used when you can buy NEW at this AMAZINGLY low price! 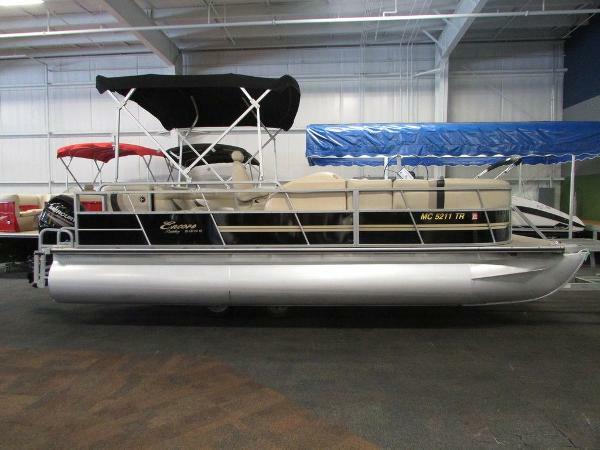 This pontoon is base-priced with a new Mercury 25 hp 4-stroke EFI outboard, however, engine options are available from 10 to 150 hp. Factory warranties include; 5-year bow to stern warranty, limited lifetime warranty on decking and pontoons, and a 3-year factory warranty on the engine. 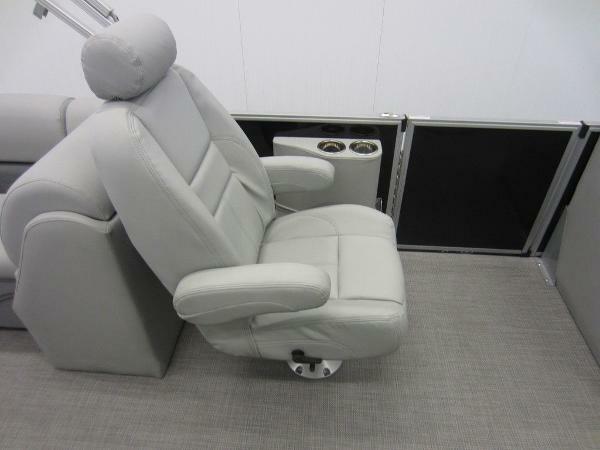 Optional equipment includes: SE gray furniture package, custom snap-on mooring cover, tilt steering, and driver and passenger deluxe high back chairs. 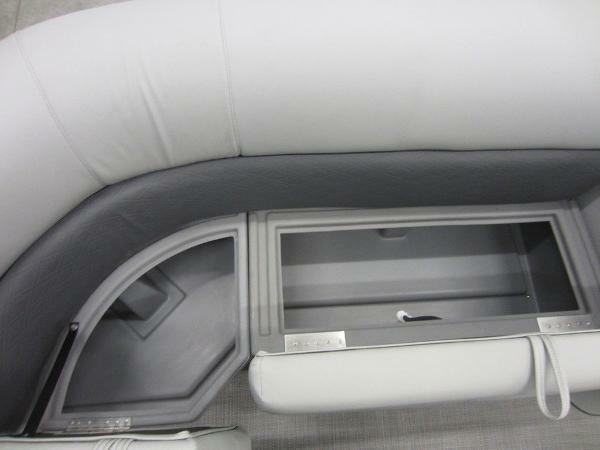 Features include: bimini top w/storage boot, custom fiberglass console w/footwell and windscreen, Seagrass vinyl flooring, Jensen AM/FM Bluetooth stereo w/AUX-USB ports, (4) marine speakers, gauges including: speedometer, tachometer, voltmeter, and fuel; electric horn, navigation/anchor lights, recessed docking lights, courtesy lights, 12-volt power outlet, emergency safety lanyard, removable table w/beverage holders, bow port and starboard layback couches w/under storage, stern port and starboard layback couches w/under storage, Rotocast composite seat bases, stainless beverage holders, (2) moveable beverage holders, bow and port entry/exit doors, center stern exit w/(2) fold-down 4-step boarding ladders, (4) stainless mooring cleats, 32-gallon transom fuel tank, fire extinguisher, marine cranking battery, 8'6" beam, thru-bolted marine decking, nylon rail spacers, M-bracket skirting, all-aluminum transom, 25" diameter pontoons, and 16-person carrying capacity. 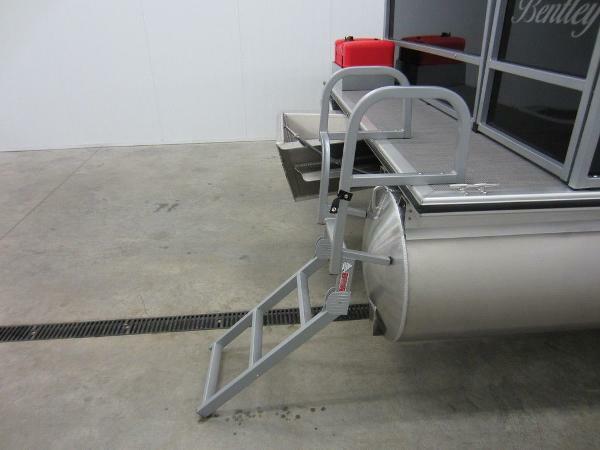 The trailer pictured is NOT included, however, float-on and scissor trailers are available for purchase. Trades will be considered and delivery is available. Competitive financing rates and terms are also available. Approximate payment is $217/mo. for 144 mo. with 20% down (WAC). Leaders RPM is one of the largest marine and powersports dealers in the Midwest with over 70,000 sq ft of showroom, parts, and service under one roof located in Kalamazoo, MI. Price is plus freight, prep, sales tax/fees and is subject to change without notice. 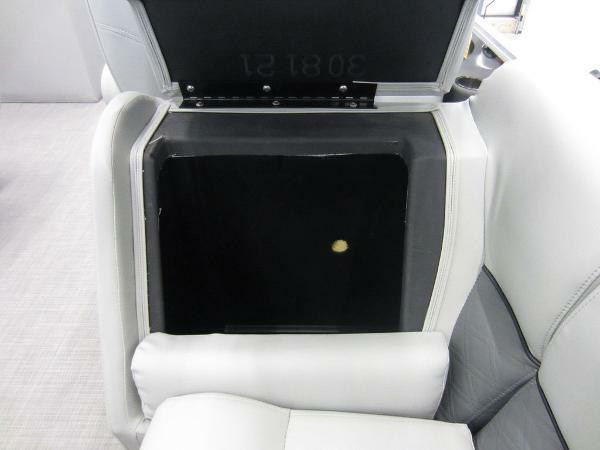 SOLD 2019 Bentley Pontoon 243 CRUISE SE RE TRITOON SAVE THOUSANDS ON THIS NEW 2019 BENTLEY 243 CRUISE SE RE TRITOON! Why buy used when you can buy NEW at this AMAZINGLY low price! Only $34,637 with a 150 hp Mercury 4-stroke! 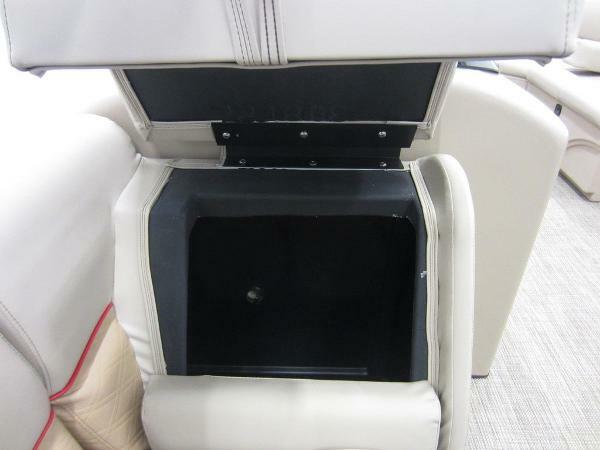 This pontoon is base-priced with a new Mercury 115 hp 4-stroke EFI outboard; however, engine options are available up to 250 hp. Factory warranties include; 5-year bow to stern warranty, limited lifetime warranty on decking and pontoons, and a 3-year factory warranty on the engine. 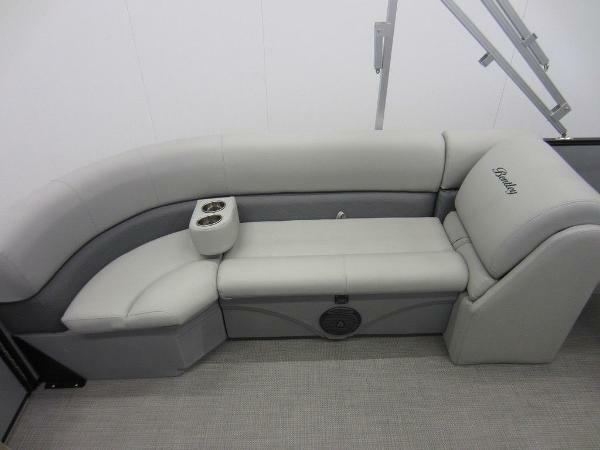 Optional equipment includes: SE tan furniture package, Seagrass tan mat flooring, deluxe reclining high back captain’s swivel chair w/sliders and armrests, snap-on mooring cover, and deluxe ski tow bar. Features include: tritoon package including; (3) 25” diameter pontoons, lifting strakes, aluminum underskin, and hydraulic steering; color coordinated bimini top w/storage boot, custom fiberglass console w/foot-well and windscreen, Jensen AM/FM Bluetooth stereo w/USB port, (4) Jensen marine speakers, Faria gauges including: speedometer, tachometer, fuel, and voltmeter; electric horn, anchor/navigation lights, recessed docking lights, courtesy lights, 12-volt power outlet, emergency safety lanyard, tilt steering, removable table w/beverage holders, port and starboard bow layback couches w/under storage (extended starboard couch), stern L-shaped couch w/under storage, bow under seat cooler w/drain, Rotocast composite seat bases, aft padded sundeck, stainless beverage holders, (3) moveable beverage holders, (2) entry/exit doors (port/bow), rear exit w/fold-down 4-step boarding ladder, (4) stainless mooring cleats, 32-gallon fuel capacity, fire extinguisher, marine cranking battery, 8'6" beam, thru-bolted marine decking, nylon fence rail spacers, M-bracket skirting, all-aluminum transom, 25" diameter pontoons, aluminum prop, and 16-person carrying capacity. 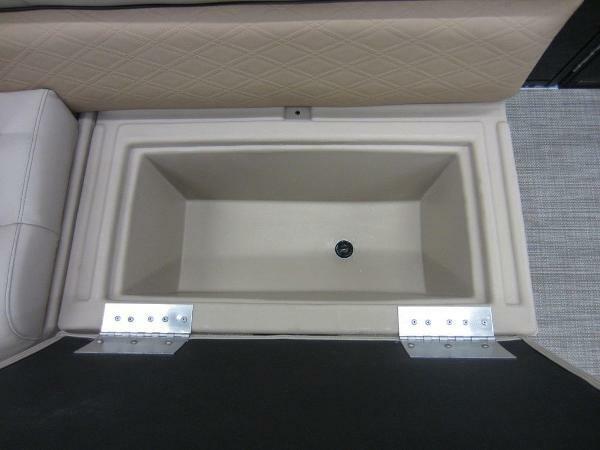 Trailer is not included, however, new and used float-on trailers are available for purchase. Trades will be considered and delivery is available. Competitive financing rates and terms are also available. Approximate payment is $294/mo. for 144 mo. with 20% down (WAC). Leaders RPM is one of the largest marine and powersports dealers in the Midwest with over 70,000 sq ft of showroom, parts, and service under one roof located in Kalamazoo, MI. Price is plus freight, prep, sales tax/fees and is subject to change without notice.